On the opening track of his second album Killed For Kings, Rich DePaolo sings, “Big world, big star, how much, how far will you go to get it all?” Well, apparently pretty far since the multi-instrumental artist creatively pushes way past his debut, For The Loss Of Divinity,” and apparently “got it” when it came to approaching …Kings’ songwriting and production, avoiding a traditional sophomore slump/jinx. Touching on veiled politics, personal revelations, fatherhood, cherished memories, and existential questions, Killed For Kings’ material smoothly flows off the pen and tongue of Ithaca, New York’s Rich DePaolo. Although it’s tempting to compare him to some of his contemporaries and obvious influences, DePaolo doesn’t need any of that, his being pretty much a master of metaphors and original-speak, like the best works of…ooh, SO tempting to go there! This songwriter’s lyrics laid bare are possibly poetic but more importantly, sharply-focused pastels, as if such a thing were possible, but it is here. The production gets the hell out of the way of while getting the most out of his music, adding only necessary accents and the occasional microfiber comforter to help communicate what DePaolo needs to deliver with supportive expression and honesty. The titles are sometimes red herrings, like “Where Believers Don’t Go,” which turns out to be more personal than instructive. “Kisses & Chains” is a terrific title for a song, though you won’t be getting what that title delivers though it seems like the most adventurous track on the project musically. But lyrically, there’s “What Are You Crying For” that includes brave lines like, “How many Jesus trips before all this bulls**t stops,” and any song that mixes werewolf imagery while asking, “Where is the Dogstar light to lead her home again?” absolutely wins. If there were complaints, they might be that DePaolo seems to rely a touch too much on the familiar while experimenting. He doesn’t need to, he’s a smart guy. Take the song “Climb.” Its waltz time signature and uplifting, raised sixth chord that appears as the second chord of the verses with a faux-country backdrop cornies-up a song that otherwise could have been more subtle and impactful. However, DePaolo emotionally commits to his vocal performance, so all is forgiven. One more thing to add is that Rich DePaolo is an artist in 2018 and might want to look at what Sufjan Stevens and how the older, more experimental folkies like Suzanne Vega—who always pushed the envelope while staying within the singer-songwriter/art-pop parameters—did it. Maybe it’s a good thing but it’s not easy to tell what audience DePaolo is aiming at—Baby Boomers? GenX-ers? Post-punk Americana? Country? No, not country, he’s from Ithaca. None of this is meant to be a diss, just a little bug-in-the-ear, good wishes for a potentially important artist who just released a solid sophomore album. 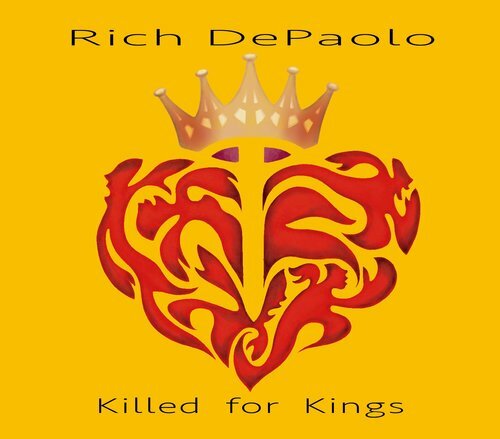 To that “potentially important artist” point, in describing Killed For Kings‘ title, DePaolo informs, “There are forces that take hold of our lives that can either be embraced, battled or ignored. The choices ultimately determine whether we can accept what we see in the mirror at the end of the day…we have all killed, and been killed, for kings.” Lovely.